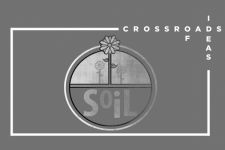 On February 16, WID Director Jo Handelsman kicked off the spring Crossroads of Ideas lecture series with a talk about long-term challenges to soil, a complex system upon which much of life on Earth depends. Iowa topsoil, for example – believed to be the deepest and most fertile in the world – is eroding at more than twice the rate that it is being replenished. About one third of all soils on Earth are in a degraded state, and replacing even a centimeter of soil can take up to 1,000 years. The Crossroads of Ideas lecture series is supported by the Morgridge Institute for Research, the Wisconsin Institute for Discovery, and WARF.